Now you have an account, it’s time to create your repository. Log in to your account and navigate to the Repositories tab on your dashboard. If this is your first repository with Beanstalk, you’ll be prompted on your dashboard to create a repository . Here you will be directed to a page to set up your repository name and URL. Be careful typing in your URL, it cannot be changed. After setting up repository name and typing URL, choose Subversion as Repository Type. 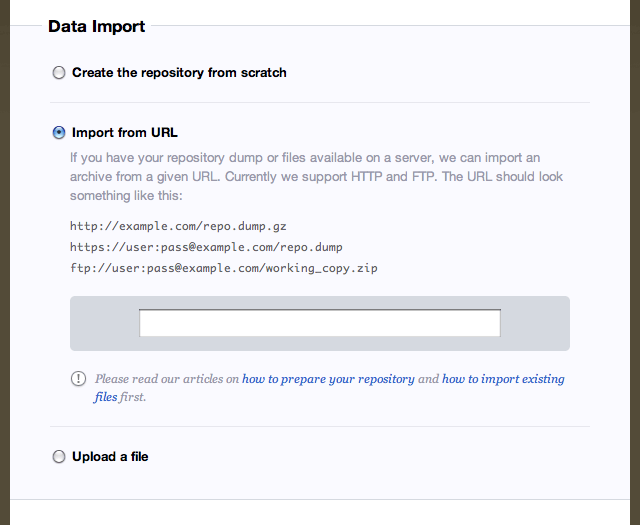 Next you can set up your repository structure. 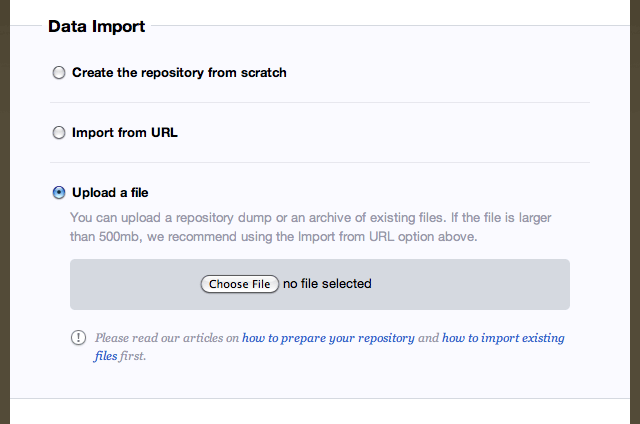 There are two different options in which you can import your files and there is an option to create repository from scratch. Use this method if you want to create a new empty repository. Use this method to import existing files or if you are migrating from another Subversion server. If you have your repository dump or directory of files available on a server, we can import them from a given URL. If you want to import a directory of files, you will have to archive them first. The structure you set up will be preserved. The files need to be archived into one folder. We support archiving dump files too. Files can be packed as GZIP or ZIP archive. Currently we support HTTP and FTP URL for importing. To learn more about creating a dump file, read this article first. Use this method to import a directory of files or a dump file that you already have on your local machine. Uploading from a file works the same way as importing from a URL, except we have a 500mb limit for importing from your local machine. After you have finished creating your Subversion repository, all you need to do is setup user permissions to the repository.